In a truly strange twist, NBC has ordered three additional episodes of their Monday night medical series, Trauma. The show was confirmed as essentially cancelled late last month when the network opted not to order any additional installments. What happened? 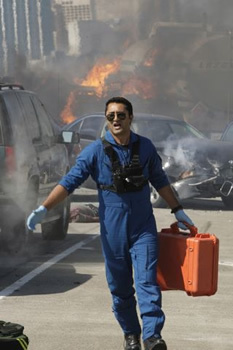 Trauma revolves around a group of first responder paramedics in San Francisco. The high-action series is populated by an ensemble cast that includes Derek Luke, Cliff Curtis, Anastasia Griffith, Kevin Rankin, Aimee Garcia, Billy Lush, Jamey Sheridan, and Taylor Kinney. Earlier today, Hollywood blogger Nikki Finke reported that NBC was considering ordering three additional installments and that news has now been confirmed. What isn’t clear is the reason why. Finke and several other sources are claiming that the expensive show’s ratings have improved. One only needs to look at the numbers to see that’s not true. Trauma debuted to lackluster ratings of a 2.2 in the 18-49 demo and 6.68 million total viewers. The second week, they dropped significantly to a 1.7 and 5.36 million. Trauma’s numbers have fluctuated a bit since then but haven’t broken past a 1.9 in the demo or 5.82 million viewers. As far as a “recent ratings rise,” there hasn’t been one. This week’s episode attracted a 1.8 in the demo (just like last week) and the total viewers were down, from 5.35 million to 5.18 million. What’s more, Heroes beat Trauma in the demo by almost 20% and neither’s figures are impressive. This decision to order a trio of additional episodes is likely more of an indication of NBC’s other ratings problems than new-found faith in Trauma. The execs may not feel like they have enough original programming to last them until the Winter Olympics or they might not be feeling very confident about their mid-season shows. Whatever the reason, the Trauma’s ratings are still not good and need help. While three additional episodes are a nice little gift for fans, unless the show’s ratings start rising, it’s just delaying the inevitable. What do you think? Why did NBC order three more episodes of Trauma? Do you think they’ve changed their minds about cancelling it or just delaying the inevitable? All the Firefighter’s in southern Indiana say bring it back. I’m a real life firefighter EMT and i didn’t find out about this show until after it was canceled this show was AWESOME. I have seen every show online and think the marketing for the show was poor and would like to see a come back. We now have Chicago Fire that is a good show but it’s not TRAUMA.